Just call me, “TheSpaDude”, (Scott is also o.k.). It is a pleasure to work with some of the most talented, and creative designers in the world! And being the lone male in the group, I feel like I have been hiding in the shadows for too long and would like to give some male perspective to the spa scene. Of course, the spa industry is predominantly a female industry. 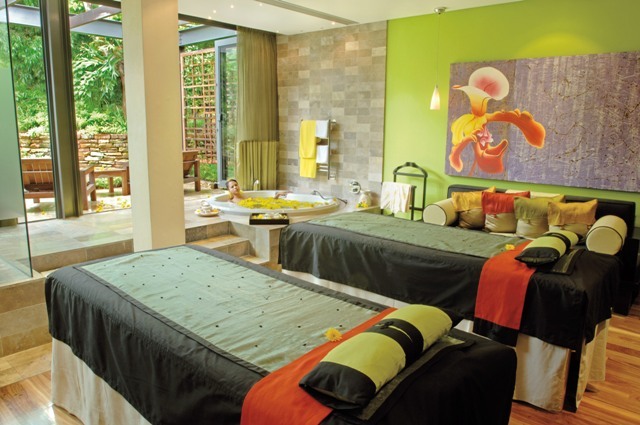 Women mainly visit and operate day spas, but recently men have realized the benefits of going to spas as well. A few very simple and basic ideas/concepts will attract more male clients and keep them returning for more. 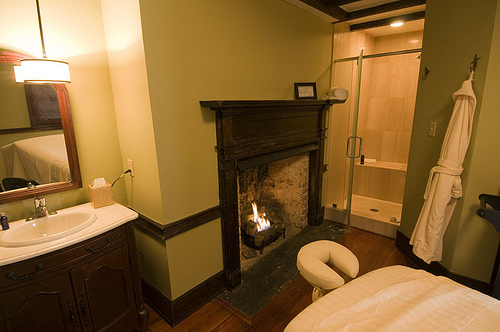 Having spa services specifically for the men will make them feel appreciated. For example, maybe you offer a facial treatment that targets problems associated from facial shaving. 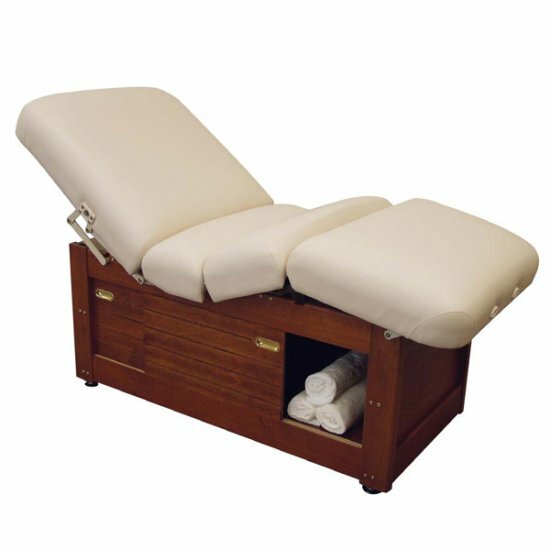 Or have a “sports type” deep tissue massage that tired, achy, athletic muscles would love! On the Design side, obviously if you are going with an ALL pink interior, don’t expect to attract many male clients. But if your spa does have a very “girly” feel you might be able to attract more men by having an area that is at least gender neutral in design and color. You can never go wrong with natural, earthy colors/tones and or textures like some stone or slate. Throw in a couple really comfy leather chairs with a flat-screen TV and the men might never leave! 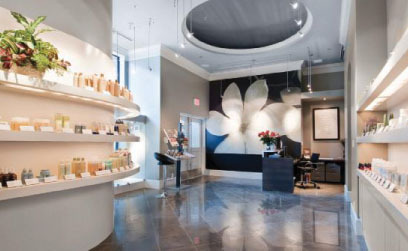 Looking to boost your spa’s retail sales this year? Below are some great ideas to get your customers buzzed about your products! Educate your best salespeople – your technicians! Your aestheticians and therapists will have the most interaction with your clients, so keep them updated with knowledge about the products you carry so they can make proper reccomendations. Many companies offer ongoing education and lunch presentations about their products. Contact your local reps and vendors to see what they can do to help keep you up-to-date! Light it up! 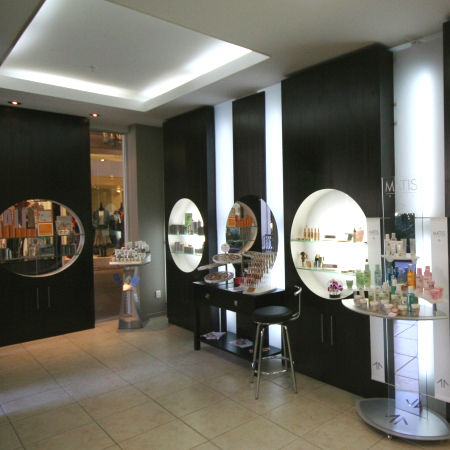 Great lighting in your retail area is truly important. Keep this area bright and highlighted so that your customers will be naturally drawn to your retail area. Add spot lights to highlight specific products, and even in-cabinet lighting to really make your products stand out. Keep your displays neat & updated. 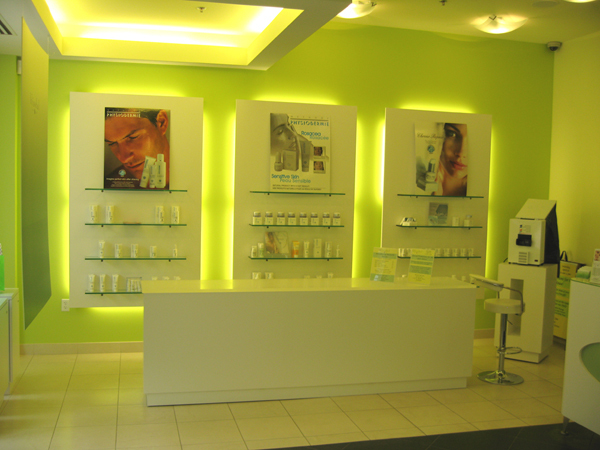 If you have regular clients coming in for treatments once a month, you want to have your displays refreshed each time they stop in. Switch up which products you feature each month, rotate where your brands are placed, and keep it fresh by updating your signage regularly. Have your staff pull products on the shelves forward and straighten throughout the day to keep it neat and organized. Don’t be afraid to mix and match your products to create interesting, eye catching displays! Offer samples to your clients. Talk to the representatives of the brands you carry to see if they offer any free samples for you to hand out. Your customers will be more likely to come back and buy some more if they have the chance to try the product and fall in love with it! Don’t overcrowd your displays. In retail, less is more. 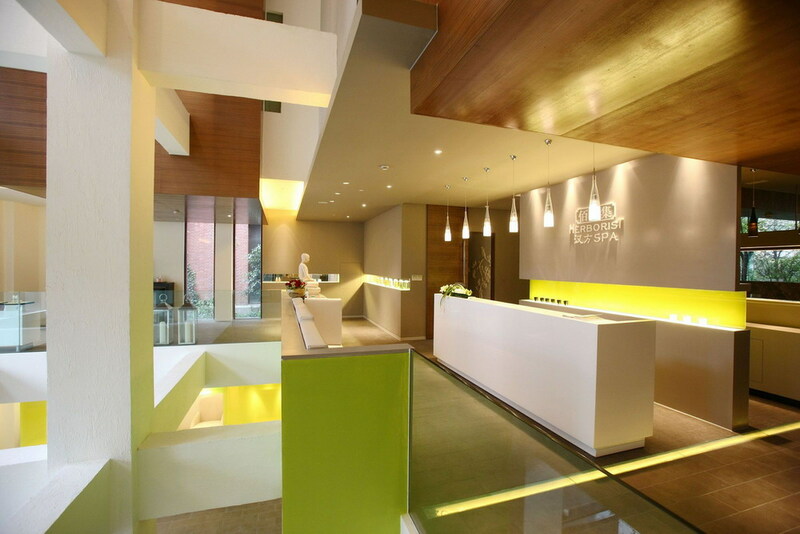 Creating a visually clean and uncluttered look will keep your retail area looking fresh. Have too much stock for your shelves? Find a place to store it until you need it! Remember – uncluttered does not equal boring! Create dynamic merchandise displays by pairing items with a shared theme. For example, group items of similar shape, with a common color, or even with a similar texture or graphics. Make your retail area a reflection of your brand. This is especially important if you are marketing your own brand of products. By creating a retail environment that encompasses your company’s look and feel, your retail will instantly become a focal point in your business. Feel free to share your tips and ideas! We love to hear from our readers! Color is one of the most powerful tools we can use to set the mood of our interiors. It can affect our senses so gently that we hardly perceive it, or hit us so hard that it takes our breath away. So much of what we comprehend is achieved through sight, and powerful memories can be made through the use of light and color. The easiest way to transform your spa’s interior is to buy a can of paint or add a pop of color through accessories. Below you can learn about how different hues affect our moods and senses. I’ve also put together some great Benjamin Moore paint selections you can use to transform your space. Enjoy! Blue is well known as a color that soothes tension and relaxes the mind. It brings to mind the airiness of a clear blue sky, or the expansive and deep oceans. It can also suppress the appetite (To those of you on a diet: Eating from a blue plate can help you eat less! ), and fuel artistic expression. Blue can help slow people’s heart rate and increase concentration. It can also make a room feel too cold, so be sure to accent this watery hue with warmer tones. This color is also said to enhance communication, reduce anxiety, and help provide restful sleep. It’s a good color to use in treatment rooms & pedicure areas to calm your guests and help them feels at ease. Light purple tones and lavender are known to enhance spirituality and wisdom. It’s also a very feminine color, and is known to reduce stress. Deeper hues of purple are associated with royalty and creativity – it’s even been said to make people more arrogant! Use deep purples as an accent in your spa’s relaxation areas to make your guests feel like royalty! 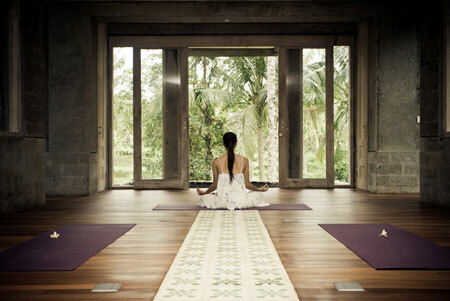 Lighter tones of lavender and lilac provide a serene atmosphere in meditation areas & the yoga studio. 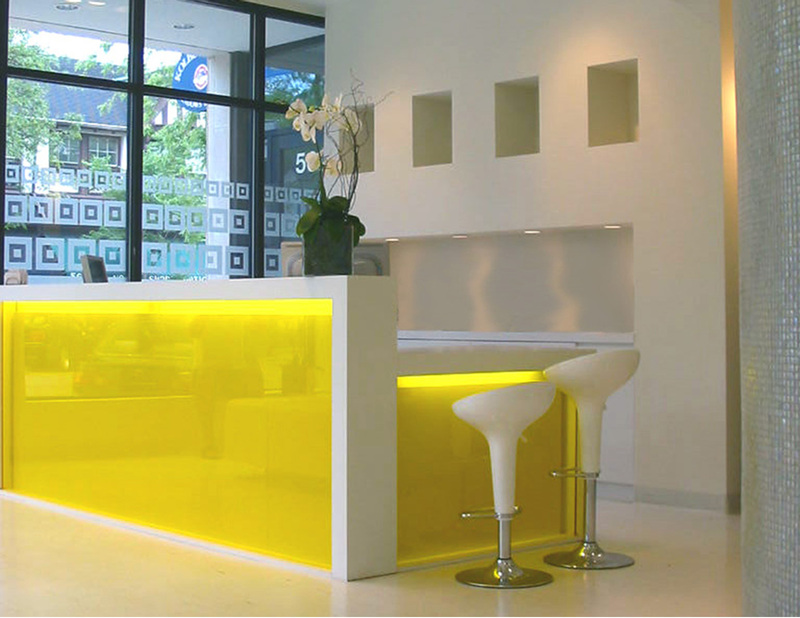 Only the boldest of the bold can handle a bright yellow room! This color is linked with happiness, energy, and warmth, but too much can cause irritability and has been said to worsen some medical conditions (Check out the book “The Yellow Wallpaper” by Charlotte Perkins Gilman for a story about too much yellow). In small doses this color can add that little touch of sunshine that we all need every once in awhile. Use within a pattern or in thoughtful accents to lift spirits and energize a room. Some well placed yellow accents in retail area signage will really grab your customer’s attention. Oh pink, you’re so girly! I have to admit that pink is one of my favorite colors – it comes in so many hues and variations from peachy to bold and fearless fuchsia! It also adds its own unique warmth and comfort to a room. While pink is mainly associated with all things feminine it also offers stability, reassurance (think: Mom), and romance. It also curtails aggression and provides a cozy sense of calm. Bold and boastful red can easily overwhelm a room. This color has been know to increase the heart beat, increase energy, and therefore cause aggression. It also helps increase your circulation, willpower, and even your libido. Adding some red in the right place can add energy and warmth to your room. It also encourages people to eat more and socialize, perfect for a bustling spa cafe or as an accent in your spa’s party room. Orange tones are often associated with joy and optimism, and can help to combat depression. Beware of using to much of this sunny hue, though – an overdose of orange is said to cause pessimism and drowsiness. This tone is linked to warmth, stability, and reassurance. Some say it even aids in digestion. Use it in areas where you’d like people to buy and go – your storefront spa cafe, spa makeup area, or in accents in your retail checkout area. 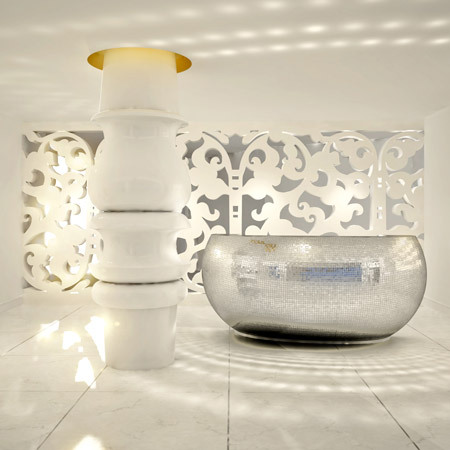 White embodies ideas of purity, cleanliness, and serenity. White rooms layered with lots of texture can be some of the most comforting and calming spaces. It provides a great, clean backdrop for displaying merchandise with bright colors, and give a pure sense of cleanliness to your spa rooms. If your lighting is too bright or your space doesn’t have texture, white rooms can easily become too sterile and bright if proper lighting and layering isn’t introduces. Make it work for you by adding hints of your favorite colors throughout and utilizing architectural details in your interior. Neutrals & browns ground your space and provide stability & security, much like the strong and mighty oak. 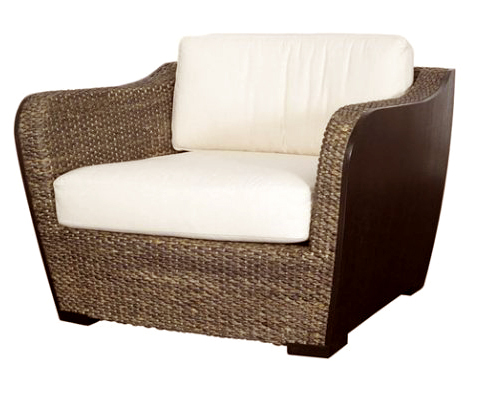 Introduce brown tones to your relaxation areas through the use of natural wood, warm toned fabrics, and grassy textures. Brown is also a great color to balance green, blue, and lavender hues and bring these dreamy tones back down to earth. Sophisticated, sultry, and moody! Black is best used as an accent color, and is another great shade to help you bring depth and drama to your space. Use matte black shelves to make light, bright art pieces and retail stand out, or add a black table to your lounge to add depth. Black can easily become dark and dreary and make a room feel closed in, but with the right layering of texture and color a black room can make a dramatic, memorable statement. Get the look of an ultra-modern European spa… Architectural lighting, soft clean colors, and lots of texture are the signature staples of this look. 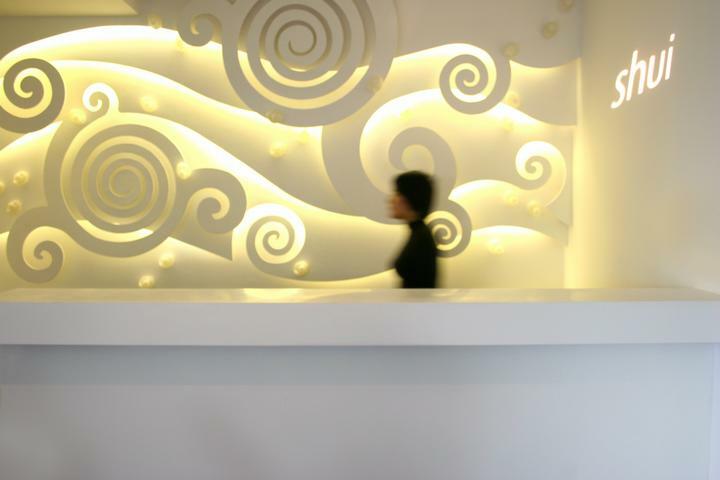 Shui Urban Spa in Shanghai offers a clean white space with swirling sculptural panels. 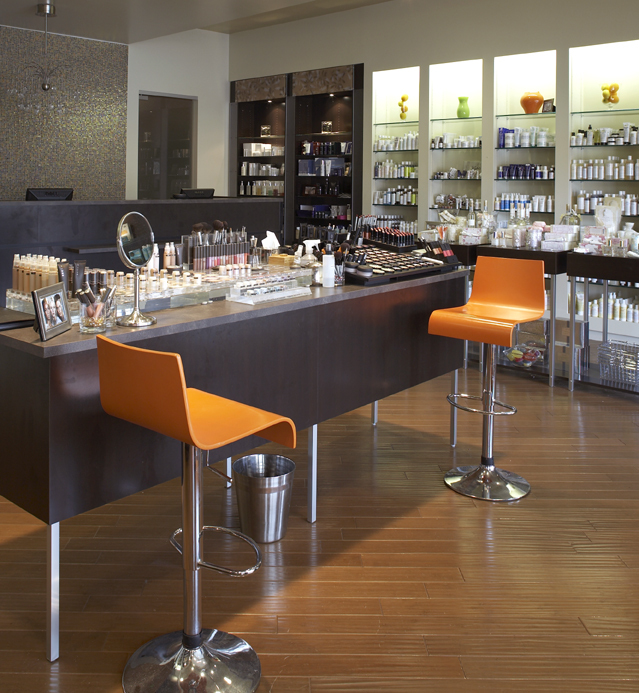 Agua Spa is super chic and glammed up! Shimmery mirrored tiles and patterned panels add tons of texture to this South Beach hot spot. 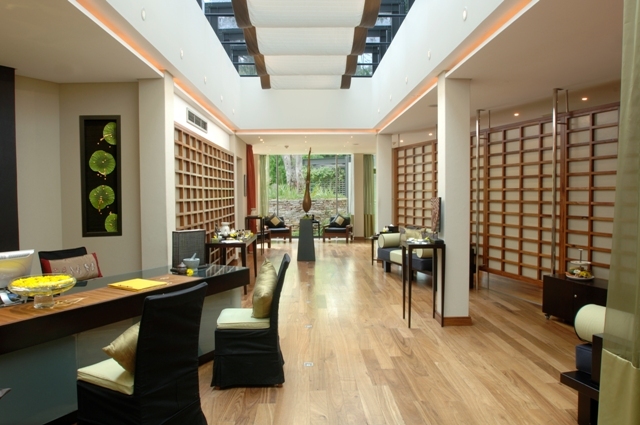 The Silver Rain spa offers a cool color palette in tropical Grand Cayman. Airy blues and creamy whites are combined with inviting textured rugs and curtains. Display your organics and your good taste with funky modern vases. 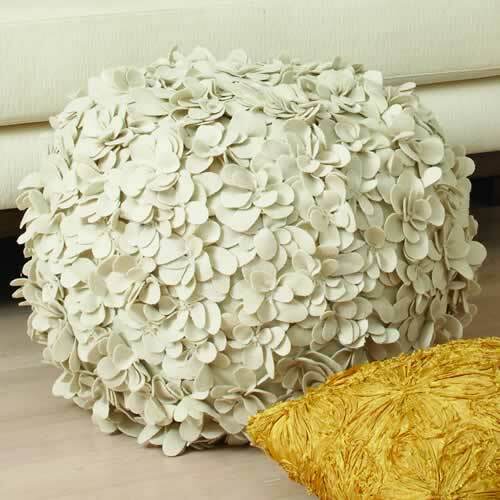 Add in texture with pouf pillows and ottomans. 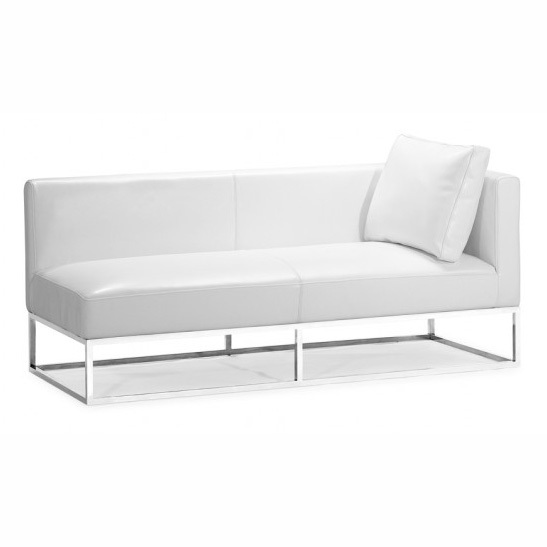 The Atom lounger has clean lines and easy-to-care-for white leather upholstery. 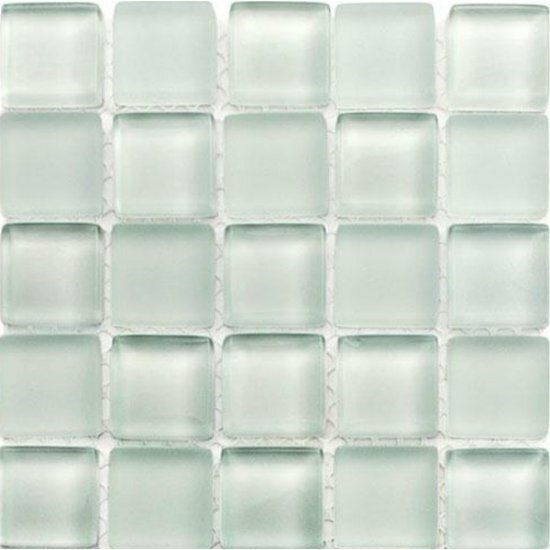 Frosted glass mosaic tiles add a hint of color and misty texture. Infuse ethereal color into your space through your floor. 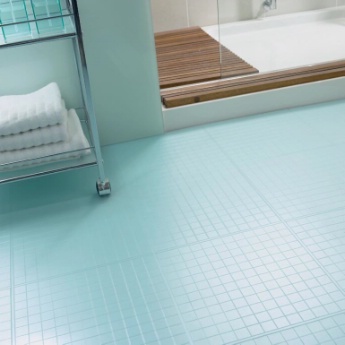 The Polar Glass flooring gives the look of water-blue glass tiles without the high installation cost. It’s easy on the eyes and your feet! It’s the high season for nail salons! 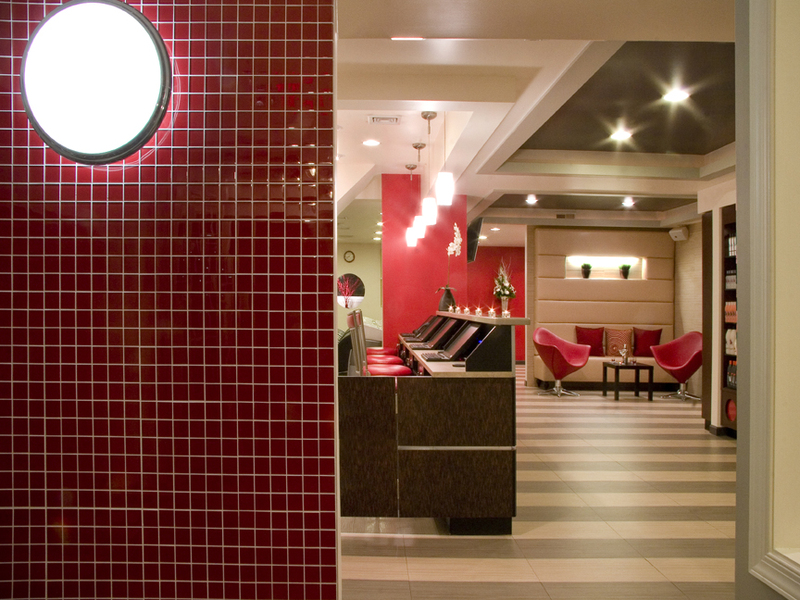 Make your nail spa stand out from the pack with unique finishes and fixtures. Check out some of our favorite inspirational spaces below! Sleek stainless steel counters are easy to take care of and make this manicure area super modern. Make your nail polish a focal point with a glowing back-lit panel. Mirrors help to make this small space feel open. A tall vase with green grass keeps it fresh. This quirky shabby chic nail spa uses a long table to display their nail polish. White washed walls and a sky blue floor leave this room feeling open and airy. The Intercontinental combined light woods, glimmering glass tiles, and clean white in their San Francisco spa. The result is cool and clean but still comfy cozy. Don’t have alot of space for your pedicure area? 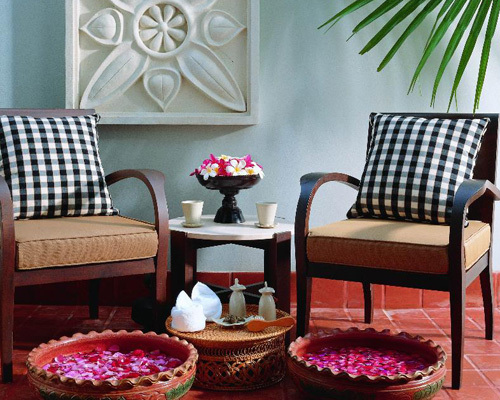 Turn any corner into a mini retreat with portable pedicure bowls and a comfy lounge chair. 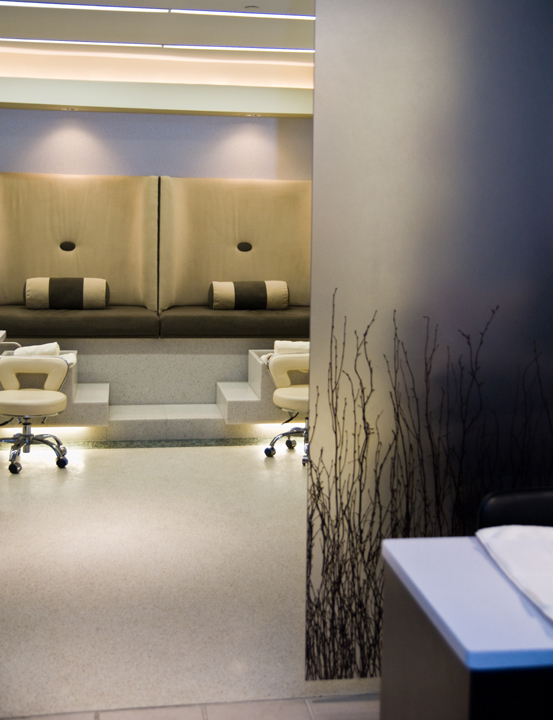 Add some glam to your nail salon with a customized pedicure unit! Hello Spa Style readers! I’m the art director and a designer for SpaStyle spadecor.com, and I’ve put together a selection of inspiring artwork for your spa interior. Look for my upcoming posts with new and fabulous artwork that we’re adding to spadecor.com! A print that features elements of the sea and fresh, green bamboo. This framed artwork is a substantial piece, measuring 53″ wide and 32″ high. Framed in a rich espresso frame, and featuring double-matting, this print reflects the image of falling drops of water. It can be hung vertically or horizontally, and measures 25″ x 49″. A gallery-wrapped print resembling a calm morning at the ocean side. An abstract that is soft and restful to the eye. Measures 27″ x 27″. Made of wood and framed in a shadowbox style, the ginkgo leaves are painted in soft metallic paint with an espresso frame. A warm and neutral piece. Size 24″ x 24″. 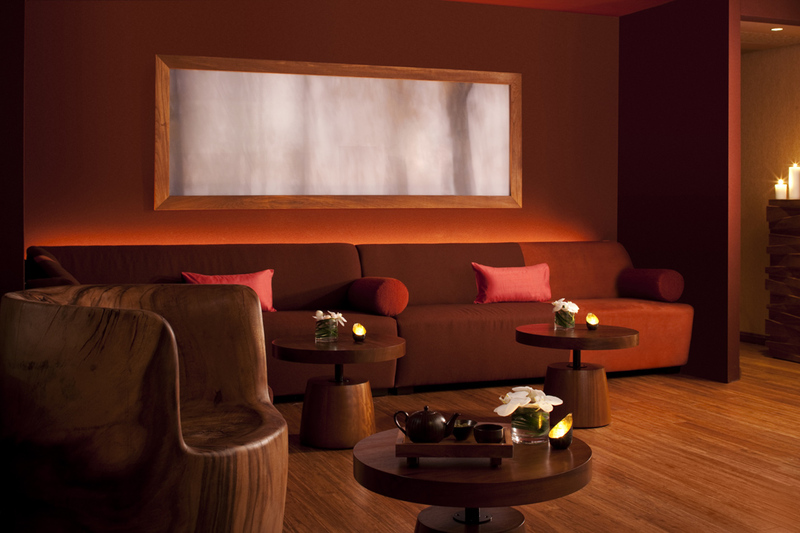 I’ll leave you with a little inspiration for your own spa interior – the treatment rooms of the Four Seasons Silicon Valley featuring artwork hung from the ceiling to create dimension in the room. So gorgeous!! !